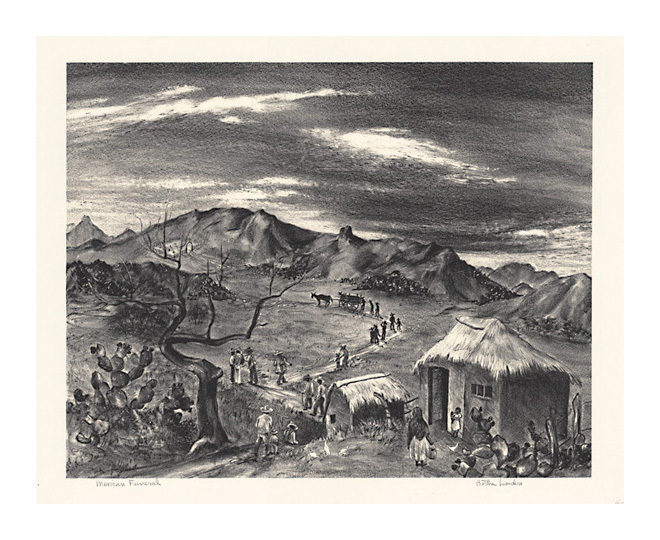 Mexican Funeral- - c.1938, Lithograph. Edition not stated. Signed and titled in pencil. Image size 11 7/8 x 14 7/8 inches (302 x 378 mm); sheet size 13 7/8 x 20 inches (352 x 508 mm). 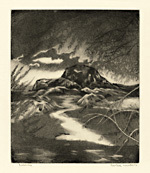 A fine impression, on cream wove paper, with full margins (7/8 to 2 5/8 inches); original tape remains on the top sheet edge, well away from the image; in excellent condition. 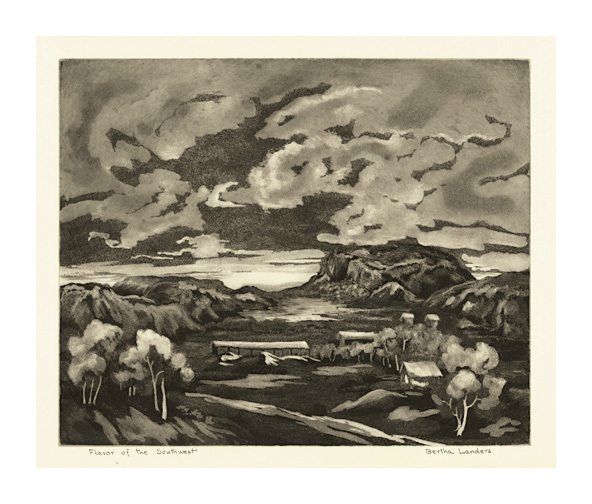 Bounteous Earth- - c.1938, Lithograph. Image size 10 3/4 x 14 1/8 inches (273 x 359 mm); sheet size 13 3/4 x 19 inches (349 x 483 mm). A fine impression, on cream wove paper, with full margins (1 1/2 to 2 7/8 inches); original tape remains on the top sheet edge, well away from the image; in excellent condition. 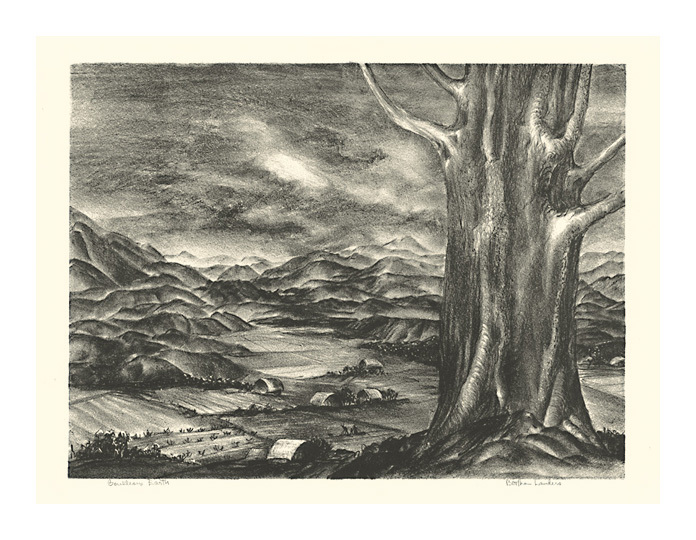 Cook's Valley- - c.1938, Lithograph. 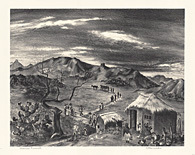 Image size 11 3/4 x 12 7/8 inches (298 x 327 mm); sheet size 16 x 19 inches (406 x 483 mm). 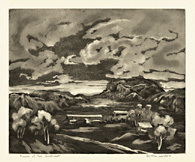 A fine impression, on cream wove paper, with full margins(2 to 3 1/8 inches); original tape remains on the top sheet edge, well away from the image; in excellent condition. 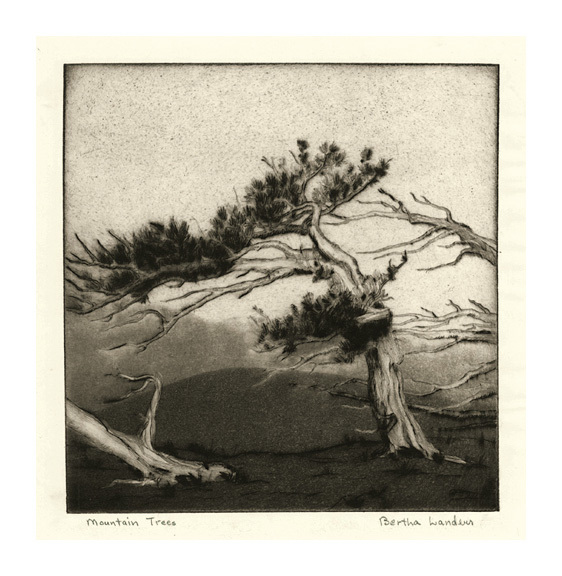 Mountain Trees- - c.1938, Etching with Aquatint. 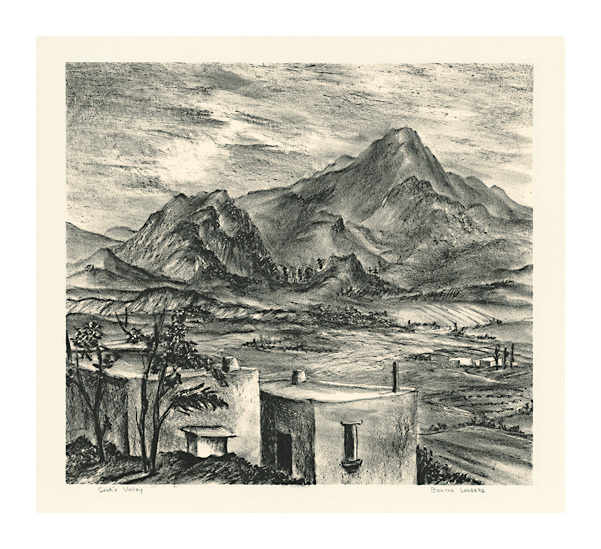 Image size 7 13/16 x 7 1/2 inches (198 x 191 mm); sheet size 11 1/4 x 9 1/8 inches (286 x 232 mm). A fine impression, on cream wove paper, with full margins (7/8 to 2 inches); original tape remains on the top sheet edge, well away from the image; in excellent condition. 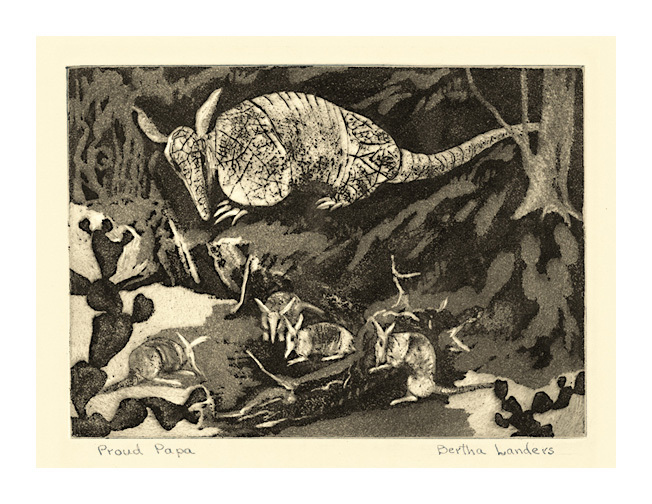 Proud Papa- - c.1938, Etching with Aquatint. Image size 5 x 6 3/4 inches (127 x 172 mm); sheet size 8 x 11 3/8 inches (203 x 289 mm). A fine impression, on cream wove paper, with full margins (1 3/8 to 2 1/4 inches); original tape remains on the top sheet edge, well away from the image; in excellent condition. 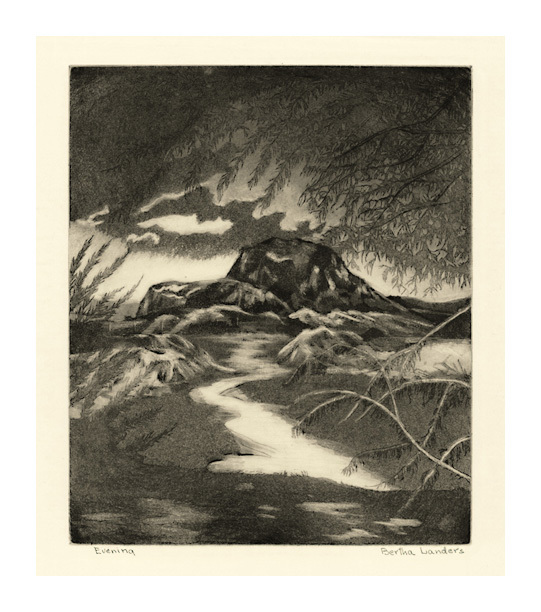 Evening- - c.1938, Etching with Aquatint. Image size 8 15/16 x 7 7/16 inches (227 x 189 mm); sheet size 13 3/4 x 10 5/8 inches (349 x 270 mm). 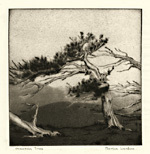 A fine impression, on cream wove paper, with full margins (1 3/8 to 2 5/8 inches); original tape remains on the top sheet edge, well away from the image; in excellent condition. 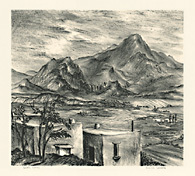 Flavor of the Southwest- - c.1938, Etching with Aquatint. Image size 8 15/16 x 11 inches (227 x 279 mm); sheet size 10 1/2 x 14 5/8 inches (267 x 371 mm). A fine impression, on cream wove paper, with full margins (5/8 to 2 inches); original tape remains on the top sheet edge, well away from the image; in excellent condition.